Ultrasonic waves of high intensity ultrasound generate cavitation in liquids. Cavitation causes extreme effects locally, such as liquid jets of up to 1000km/hr, pressures of up to 2000atm and temperatures of up to 5000 Kelvin. When sonicating liquids at high intensities, the sound waves that propagate into the liquid media result in alternating high-pressure (compression) and low-pressure (rarefaction) cycles, with rates depending on the frequency. During the low-pressure cycle, high-intensity ultrasonic waves create small vacuum bubbles or voids in the liquid. When the bubbles attain a volume at which they can no longer absorb energy, they collapse violently during a high-pressure cycle. This phenomenon is termed cavitation. During the implosion very high temperatures (approx. 5,000K) and pressures (approx. 2,000atm) are reached locally. The implosion of the cavitation bubble also results in liquid jets of up to 280m/s velocity. The video (download, 1.69MB, MPEG1-Codec) to the left shows a sonotrode in a glass tube, that is filled with water. 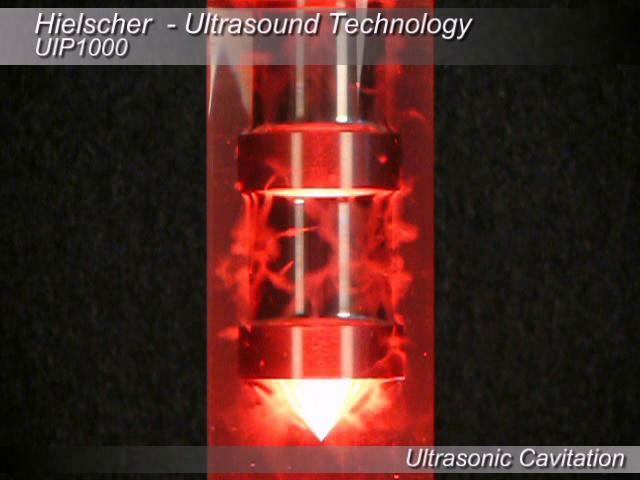 The high amplitude generated by the UIP2000hd ultrasonic processor induces cavitation bubbles. Red light from the bottom of the tube makes the vacuum bubbles visible. The actual diameter of the tube is approximately 150mm. The setup inside a flow vessel is comparable to that in the video. The penetration of the liquid by cavitation is highly visible. To download the video, please click on picture to the right. The effects can be used in liquids for many processes, e.g. for mixing and blending, deagglomeration, milling and cell disintegration. In particular the high shear of the liquid jets causes fissure at particle surfaces and inter-particle collisions.